2018 has unintentionally become my Yes Year. The year I’ve said “yes” to things I’ve never done before, experiences that scared me, events I didn’t have time for, opportunities that seemed unreasonable (at least initially), situations that looked like I’d fail from the start, occasions where everything felt stacked against me. –Should I try writing one of the most difficult and personal poems I’ve ever written? Yes. –Should I keep doing stand-up comedy even though it feels like I’ll die from nerves on stage every single time? Yes. –Should I speak up about the lack of diversity at work, risking repercussions? Deep breath… Yes. that I haven’t written down, only thought about? Most def. –Should I re-apply to the radio training program that rejected me last year? Why not? –Should I travel through Egypt alone? Yes, just don’t tell mom. and move cross-country to follow my dreams of being a radio journalist by doing Audio Academy, as they’ve now accepted me!? Without a second thought. –Should I tag my beloved Williamsburg Bridge—which I’ve therapeutically run over for nearly eight years and whose graffiti has been the source of so much inspiration and decision-making—in the middle of the night before I leave NYC? No comment. Now in San Francisco, I’ve kept saying “yes” these past two months (exactly two months on November 2nd!). –Should I go to Berkeley for a people of color audio storytelling conference my first weekend home instead of unpacking? Yes. –Should I go “all the way” to Oakland to read a poem at The Root Slam on a Friday night? Yasssss! –Should I do a stand-up open mic even though it’s dominated by dudes and there will be two people in the audience by the time I go up? Errr… I guess. –Should I Karaoke for the first time in front of my new colleagues even though I can’t sing? Eeeeek! Fine. –Should I ask the source to repeat his answers when I realize I wasn’t actually recording? Seriously, JoAnn? Yes. –Should I volunteer to do a tape sync even though I’ve never done one before? Yes. –Should I volunteer to translate in Spanish for justice reporter Holly McDede for a piece she’s doing on sexual harassment in hotels? This is what I came to do. YES. –Should I go to a voter information event even though I’m registered in Texas? Sure. –Should I volunteer to help with KALW’s Litcrawl event? Yes, please. –Should I volunteer to help with Election Day coverage? Let’s DO this. Some things have worked out better than others… But with every mistake I make, task I comically fail, transportation mishap I encounter, person I meet, conversation I have, question I ask, interview I do, event I attend, class I take—I’m continually reminded that I made the right decision in moving my life to the other side of the continent. While it certainly hasn’t been easy, it’s been incredibly rewarding, humbling and inspiring. It’s made me realize that I couldn’t have had my Yes Year without the emotional support from family, friends and co-workers to catch me when I fall and when I’m too weak to get back up again. 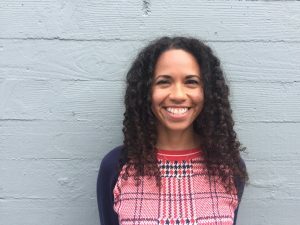 Since arriving in San Francisco and starting Audio Academy, I’ve been in a constant state of gratitude and awe while working in a newsroom full of award-winning journalists who value diversity, produce stories that make a difference and give a platform to voices that are rarely represented in the media. I’ve been reminded why I wanted to become a journalist in the first place. Two things stand out about the KALW crew. The first is their insistence to “just be yourself.” Having been a print journalist for a decade, I’ve worked in many newsrooms around the world that weren’t as diverse as this one. “Be yourself” didn’t often feel like an option. Conforming, at the risk of becoming invisible, seemed like the only way to thrive—or simply survive. At KALW, differences are not only encouraged, they’re genuinely celebrated. This makes it easier to just be me and to speak up, because I know my co-workers are listening. It’s incredibly refreshing. Two, KALW doesn’t really say “no.” It may not be a wholehearted “yes,” but it’s never a straight “no.” This means the spectrum of stories I can pitch and work on is broad. “Being yourself” is also important because, my interests and passions now have the potential to become original audio stories. Although the multitude of choice is a tad overwhelming, it’s exciting and great for continuing my Yes Year. My biggest challenge is learning how to write for radio after writing for print for so long—not simply print, but for such nuanced and technical trade publications that focused on business, finance and technology. It’s as formal and complicated as writing gets. Regardless of genre, writing emphasizes the importance on developing your “voice.” With radio, it’s my actual voice that will have to say everything I write. This has a big impact on what I actually write and how I write it. Sounding natural can be extremely difficult. In it she sings: “Flowers are bloomin’ under gray skies and moons. Seems like I’m winnin’ every time I lose.” This is what they mean by “Do what you love.” I’m doing it. I’m loving it. Even the mishaps.